Modojo browses through the back-catalog of the kings of management sims. 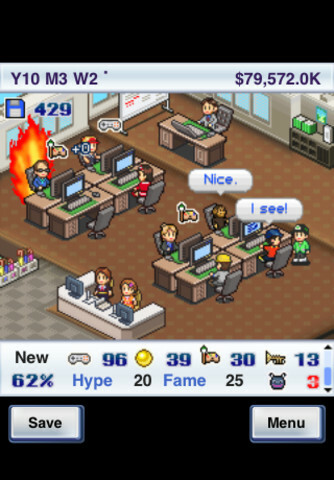 If there's a developer in mobile gaming who's taken a style of play and truly owned it for themselves, it's Kairosoft and their collection of quirky management sims. Game Dev Story caught the global gaming buzz when it launched and the developer hasn't looked back since. Here we'll take a look through their entire catalog to bring you up to speed on what this Japanese developer has achieved since arriving on the scene. Where it all began, and it's hard to overstate the immense popularity of Game Dev Story. Taking charge of a small development studio, players are tasked with hiring and firing new staff, building award-winning videogames all the way from design document to bug-testing, and then releasing the finished product to an expectant audience. As an incredibly tardy person who's driven mad by being kept hanging around by friends, I was once late for a job interview because I'd sat on a train platform in order to finish off my latest digital masterpiece. 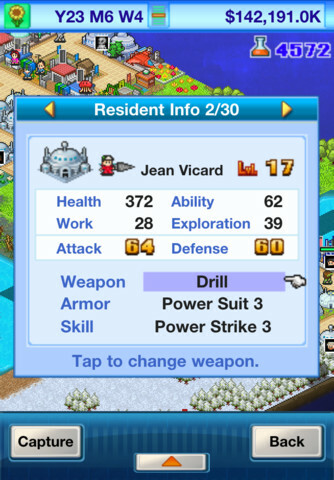 Dangerous stuff, and still the very best of Kairosoft's output. How do you follow-up an immensely successful game like Game Dev Story? You give people more of what they liked the first time around, but with a different setting. Hot Springs Story didn't revolutionize the genre the developer had carved out for itself, but it did offer something a little different for Western tastes. With the focus on customer (instead of staff) satisfaction, the game requires you to build the ultimate bath-house with an attentive eye on creating a zen experience, placing rocks and plants accordingly. Taking a (literal) vertical slice of the sim market, Mega Mall Story underwent a change of perspective from previous titles, adopting a 2D side-on view of proceedings. Gamers are tasked with building the greatest, grandest monument to capitalism they can muster from themselves, upgrading shops and facilities along the way. 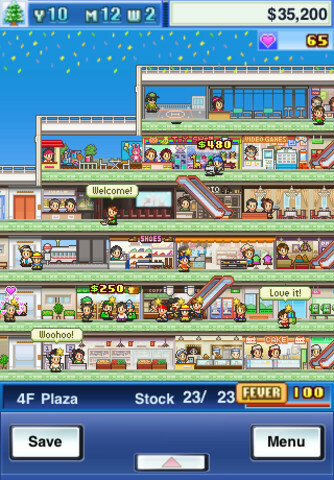 A never-ending pyramid of enhancements opportunities made Mega Mall Story the most complete Kairosoft title so far. The more eagle-eyed among you will have caught onto a trend by now. This time around you take charge of a motorsports team as they battle through championshipsin order to prove themselves the kings of the road. Managing and attracting new sponsorship deals is very much the order of the day, and you'll need to use your best preparation skills to keep your cars ahead of the competition. Researching vehicles, tuning and acquiring new parts will keep your fingers busy, and then there's the drivers and mechanics to be managed. More of the same then, but still thoroughly enjoyable. Perhaps recognizing that you can maybe have too many games with 'story' at the end before consumers start to feel a little saturated, Oh! 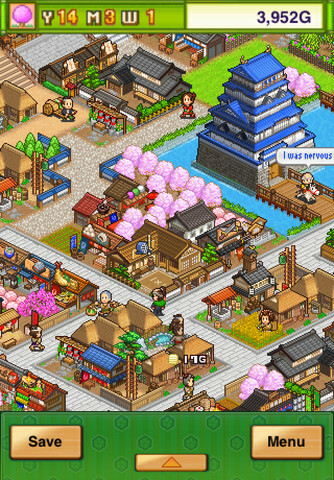 Edo Towns brings city-building to the peaceful surroundings of an old-world Japan. Oh! 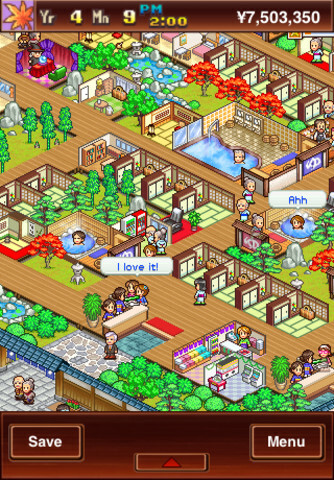 Edo Towns may have strayed from the naming convention, but it was still every inch the obsessive management game fans had come to expect. 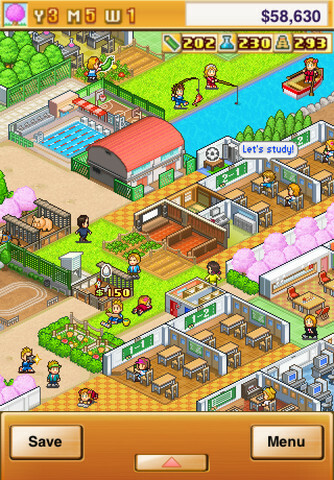 If I'm finding myself running out of ways to introduce the next in a line of cute but compelling management sims, Kairosoft certainly weren't when they released Pocket League Story. 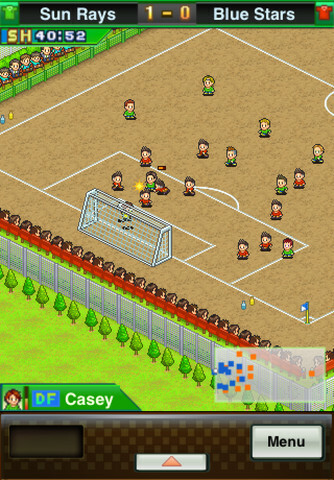 You probably have a fair inkling of what's coming next in this section of the round-up, but on this occasion the developer released (wait for it) a management sim based on the trials and tribulations of running a team of football (or soccer, if you prefer) players. An approachable title, Pocket League Story required no intimate knowledge of football but remained deep and engaging with its team building sections and on-pitch strategy preparation. If you've ever dreamed of exacting revenge on your old teachers, or at the very least going back and showing staff and pupils alike who's really in charge, 2011's Pocket Academy provided the answer. As you expanded classrooms and improved facilities, the game offered a much more experimental experience for the gamer, relying less on hard stats and more on trial-and-error. Turning out a batch of egg-heads gained the admiration of your administrators, which in turn brought more funding, and more expansion opportunities to your fledgling institution. 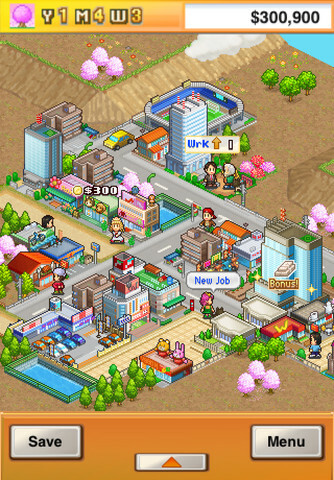 As Kairosoft's games slowly evolved, taking the best of previous editions and teasing gently at the edges of what its fans expected, Venture Towns was very much a transition from the Japanese setting of Oh! Edo Town to a thoroughly modern city setting. Again starting off with the smallest of villages, players balance the income and expenditure of the games citizens while carefully managing the availability of building space to ensure citizens can find exactly what they need, exactly when they want it. 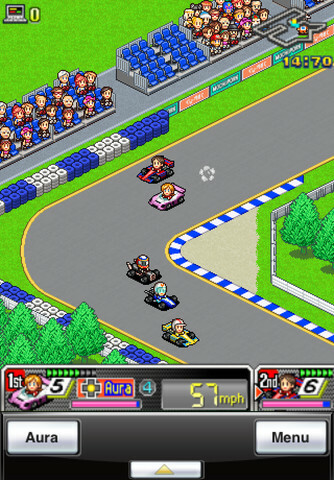 Kairosoft takes off into space for the final game in our round-up. This time, gamers took to the stars in a sci-fi flavored take on the traditional sim management game. Throughout the course of colonizing a planet, Epic Astro Story makes plenty of tongue-in-cheek nods to sci-fi franchise favorites and does a great job of building on the experience the developer had gained. It's fitting that the final entry should mark the culmination of Kairosoft's work, drawing as it does on all of the successes of previous games.